Val Thorens is the highest ski resort in Europe at just over 2300 metres. 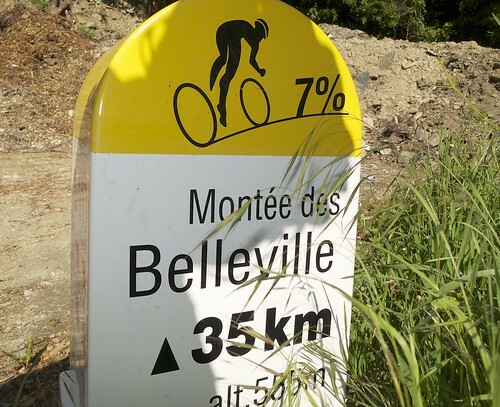 While never too steep, and with some downhills it’s a massive 38 kilometre climb with 2000 metres of ascent. Wow! It’s been a long harsh winter that just won’t seem to end (we had hail yesterday). The Giro had to cancel or alter most of its big mountain stages, and who knows when the big alpine passes will finally open. I often get emails from people saying they are visiting the Alps in April, May, or June and will such-and-such pass be open. 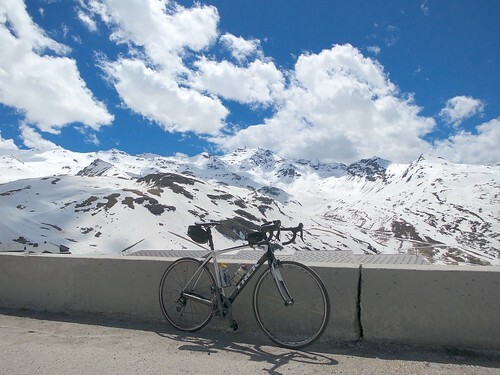 Who knows, it can vary greatly from year to year – see my “Alps Cycling FAQ” for links to official road closure sites . But to people that want to cycle up high BEFORE the big climbs are open I always say: Go where the skiers go. Ski stations have to keep their roads open all year. And if it is sunny and there hasn’t been any recent precipitation, it can be possible to road bike a huge dry-surfaced climb even in the middle of winter (yes, Alpe d’Huez is open all year). Because Val Thorens is so high, it has skiing through to the first week in May. So I decided to visit the second week in May — less traffic. Traffic-wise the only days to truly avoid would be any Saturday during ski season — huge travel day. early on, and a little later one could climb to Sauce. Also one could descend the bottom half on the other side of the Gorge by turning off at Les Frenes. I wasn’t feeling very strong, but enjoyed this huge, early season climb. Some other ski station climbs: Les Arcs, La Plagne, Courchevel, Méribel, Flaine, Avoriaz, Saisies, etc. 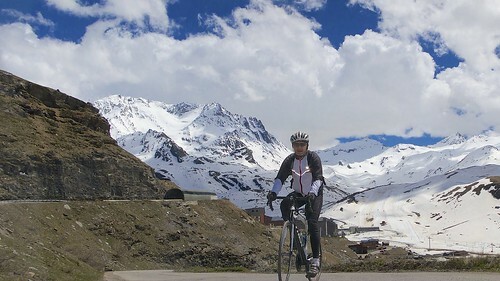 Nice tour Will, Val Thorens is on my list for this summer too. I was wondering if the route you took is the more or less ‘official’ way to climb Val Thorens? I think the other side of the gorge, the D96 crossing Planvillard, seems a bit shorter? I don’t know about official, but the route I took is definitely the main road. I have never ridden the other road, so I can’t 100% recommend it. But my suspicion is that it may be better than the main road, as it skips the first few kms that are a little busy (not very) only since the road leads up to so many villages. As I want to do a lot of climbs and my number of days in the area are limited, I will have to choose between some cols (which is of course a pity with so many great climbs nearby). There are cols like the Cormet de Roselend and the Col de l’Iseran that I have no doubts about, but for one day I may have to choose between Val Thorens and the Col du Joly. What would you recommend? Personally, I prefer Col du Joly. Two reasons: First, It’s so quiet. Second, the views are better, especially on a sunny day as you reach the summit. It’s also probably more convenient for you if you’re already doing Roselend. Thanks Will, Col du Joly is on my list now. One final question: what do you think of La Plagne? Is it a nice, beautiful climb and or just another ski station that I can easily skip without feeling bad about not having done it? La Plagne is a very good, big climb …. but certainly not as outstanding as Roselend or Iseran. Mainly (numbered) hairpins up the side of a mountain. Went up this summer. Didn’t like Val Thorens as took a while to find a café in the summer? Fortunately had a great coffee break in the very pretty hamlet of St Jean de Belleville on the way up. Meribel is far more picturesque! Really? I would have said the opposite. I suppose it’s all in the eye of the beholder. For me, Méribel in not an interesting climb. Pale comparison to Val Thorens. But just my 2 cents.